The San Marcos River is one of the most beautiful and scenic waterways in the Lone Star State. My son Jonathan introduced me to the river when we started kayaking and canoeing a few years ago. Since then I have paddled the entire length of the river many times — from its spring-fed headwaters in San Marcos all the way to the confluence of the San Marcos and Guadalupe Rivers near Gonzales, Texas. Because the San Marcos is such a beautiful river, it attracts lots of visitors. During the Spring and Summer months, hundreds of people visit the river every week, many floating the steady current on inner tubes. Sadly, many of these visitors fail to abide by the “Leave No Trace” Boy Scout mantra and leave behind all sorts of garbage that gets snagged along the banks of the river. Other garbage also makes its way to the river, some swept there by heavy rains and flooding. 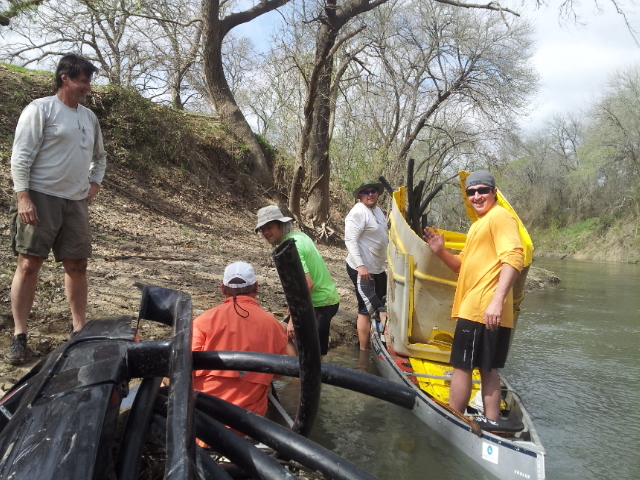 For the past 29 years, Texas paddlers have participated in the San Marcos River Clean-Up, officially the world’s longest river clean-up initiative. 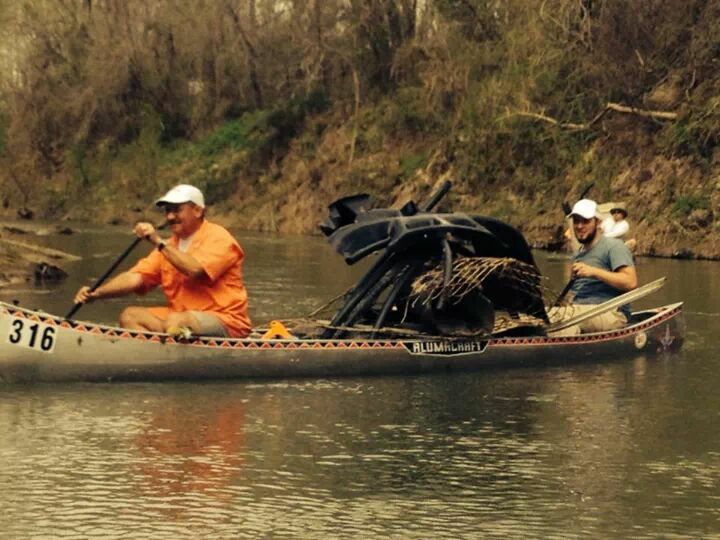 Recreational paddlers and racing enthusiasts join forces to clean every mile of the river. 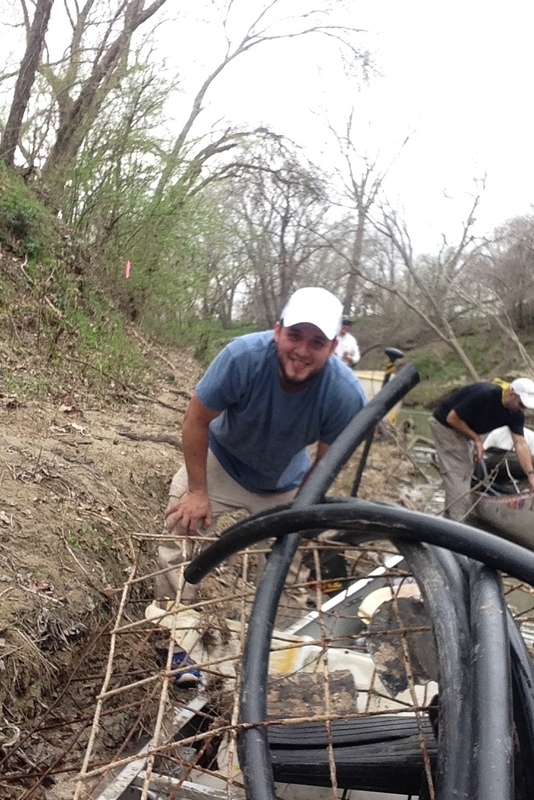 This past week I met my son Jonathan at Palmetto State Park to join the crew responsible for cleaning the lower section of the river from Palmetto to Gonzales. Jonathan has helped with the clean-up in the past. 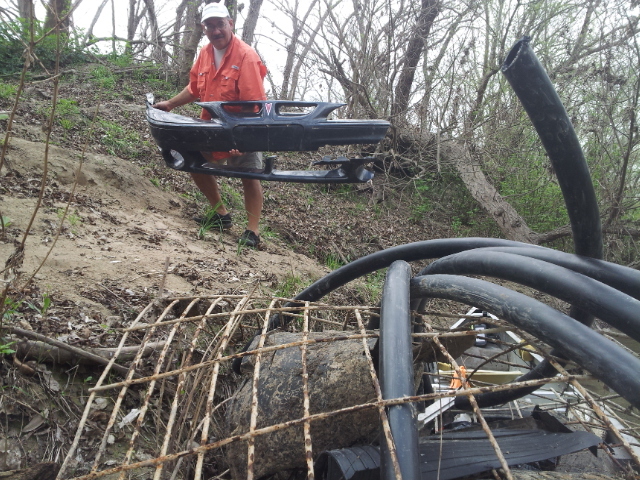 He did not want to miss the opportunity to once again help to keep the river clean for future paddlers. Our assigned section was a little more than 14 miles long, a distance we can quickly and easily cover when training or racing. 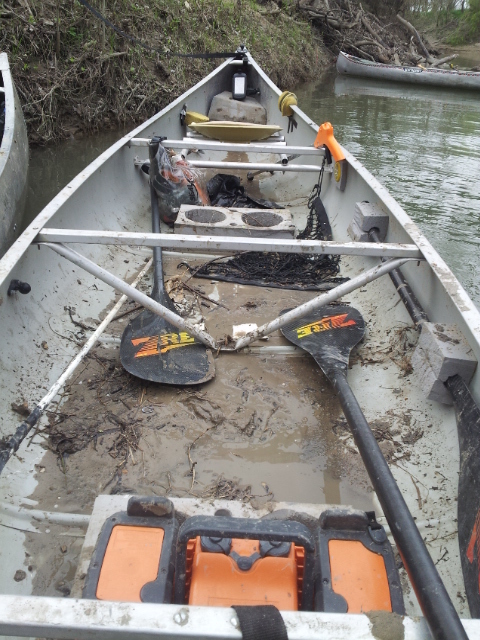 However, this day was about paddling slowly and picking up every beer and soda can, plastic bottles, old tires, and all sorts of assorted garbage that had been swept downstream. It took us and our team members all day to clean our section. 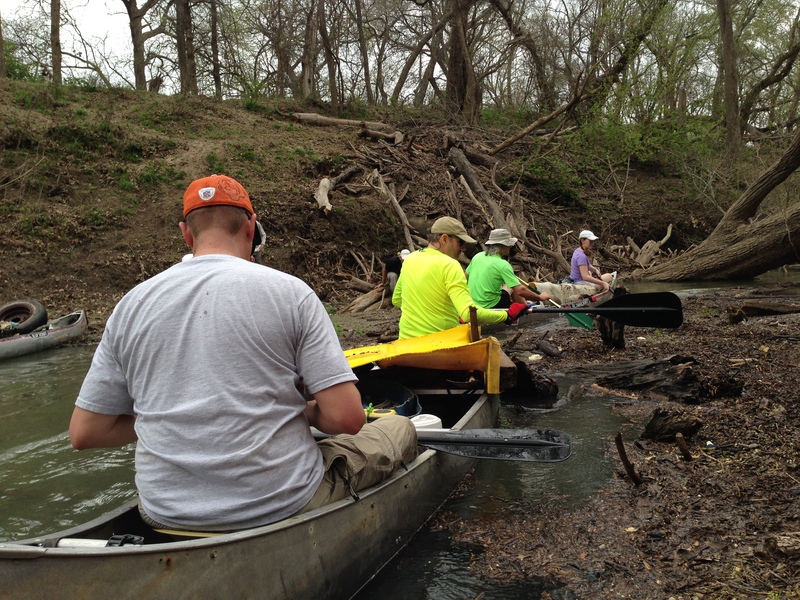 I estimate that we filled each canoe with at least 400 to 500 pounds of garbage that we off-loaded at the half-way and finishing points. I can’t imagine what the San Marcos River might look like if Texas paddlers did not take ownership of keeping the river clean. Our team recovered numerous car tires, bags of assorted trash, two porta-potties, glass bottles, air mattresses, a blue dress, irrigation tubing, a Pontiac car fender, barrels, and other junk. We scrambled up and down banks, pulled stuff out of trees, pushed a few snakes out the way to get to some trash, and got really dirty. 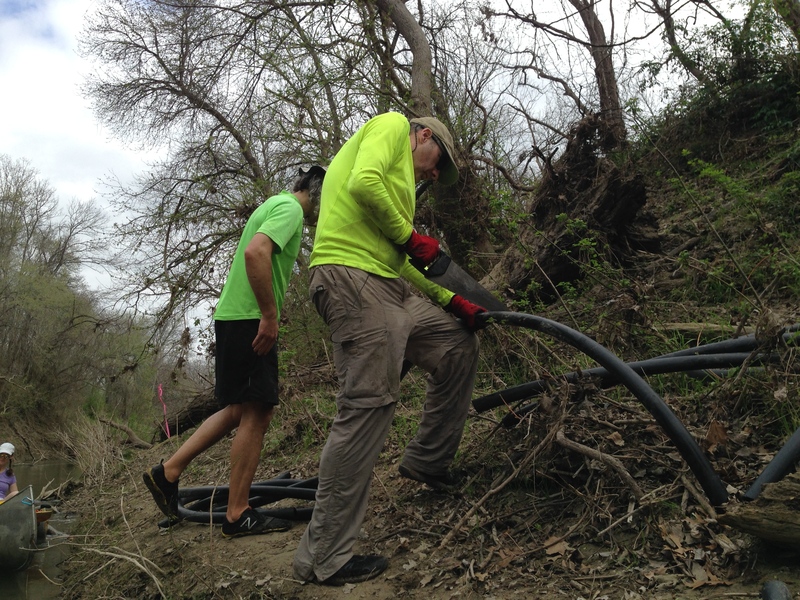 One landowner along the way stood on the banks and thanked us for our efforts to keep the river beautiful. At the end of the day I couldn’t help but think about all of the trash we had picked up. Most of it ended up along the banks because of careless individuals who enjoyed the river but did not give much thought to keeping it clean for the enjoyment of others. Being a good steward of our natural resources is the responsibility of each of us. A single piece of garbage thoughtlessly discarded by one out of every so many persons quickly adds up to lots of pounds of trash. I’m thankful for those who have faithfully organized the river clean up for the past 29 years and for every person who has participated in this environmental initiative. 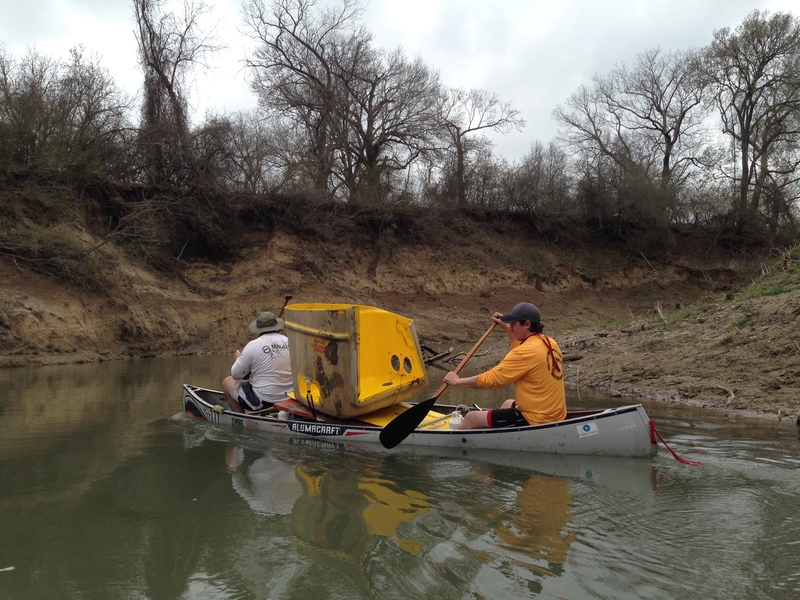 And, as a Texas paddler, I am glad that I had the opportunity to join my son and others in keeping one of the most beautiful rivers in Texas clean. I hope to take part in the river clean up again next year and for years to come. It’s a great way to bless those who will come to enjoy the river after us.